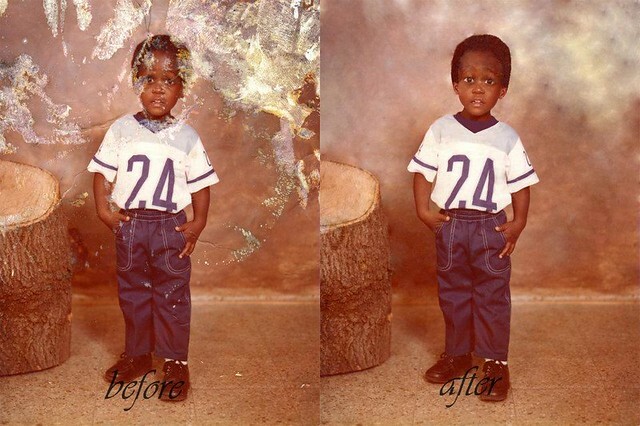 The image above shows a before and after of a photo restoration of an old photo black boy. Using Adobe Photoshop, I received this photo thinking that I couldn’t make it but I took this as a challenge. First, open an image and make sure to create a duplicate of the photo you want to fix. You can rename the layers as photo 1 and photo 2. Make the photo 2 as the photo you want to fix on. Leave the photo 1 alone. I tried to clean up the background on photo 2 and the wood using patch tool. You can also use the healing brush tool and spot healing brush tool. Later on, I searched for a little black boy’s ear on Google. Resize the ear to fit on the boy’s head. Click the photo 2 that indicates visibility so that you can compare the photo 1 and the progress of the restored photo.